September 22, 2016|Posted in: Holidays and Seasons, Let's Eat! 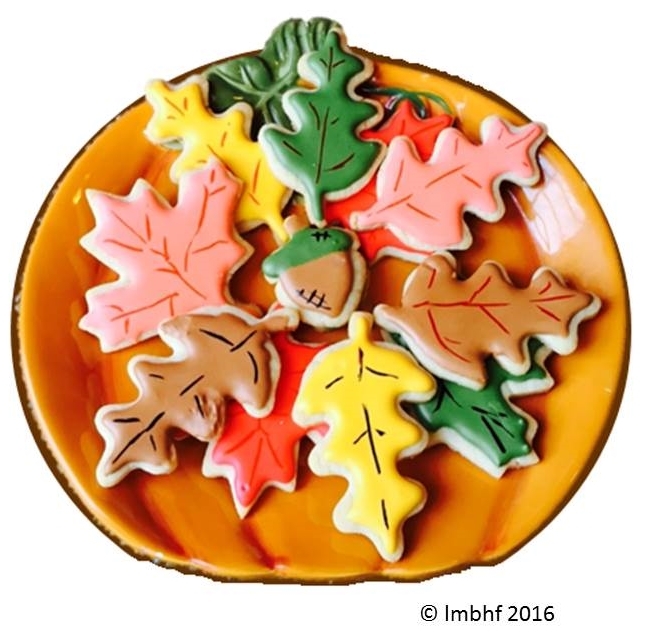 These delicious fall leafsugar cookies are easy to decorate for any holiday or season! Mix together flour and baking powder. Using your mixer combine the sugar, butter (softened), egg and vanilla extract. Mix well. Gradually add flour and baking soda mixture and mix until dough can be formed into a ball. (If dough is too dry add water two or three drops at a time until it reaches the desired consistency). Knead dough into a ball, place it in a zip lock baggie and refrigerate 25-35 minutes. Dough should be firm but not hard. Roll dough to desired thickness and cut into shapes. Bake in a 350 degree oven until cookies have just a touch of golden brown. (Time will depend upon size and thickness of cookies – usually 10 – 12 minutes). Mix together 1 Tbsp meringue powder for every cup of powdered sugar. Add water and mix to desired consistency. To make these cookies you want to use icing that is of “flood” consistency. That means it won’t run off of the cookie but will still run together to fill in for a smooth iced finish. Pipe an outline around the cookies and then fill them in with icing. Use a toothpick to blend together any small gaps in the icing. Once icing has dried, you can use edible ink pens to add details (optional). Yield depends upon size and thickness of cookies. 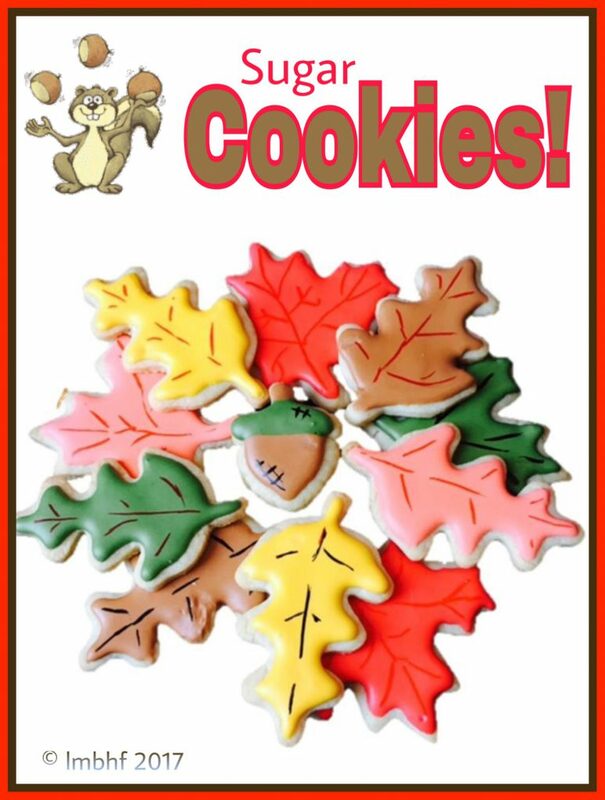 Enjoy your yummy Fall Leaf Sugar Cookies! Also, check out these related products from Amazon. If you click on the photos or the descriptions below, you’ll be redirected to Amazon where you can purchase the products. Colorful cookies. Thank you for linking up with us at #HomeMattersParty . We would love to have you again next week . Those are some good looking cookies, looks so real! Thank you Lori for linking up and co-hosting at the #BloggingGrandmothersLinkParty. I shared your post on Facebook, Google+, Pinterest, and Twitter. These cookies look almost too beautiful to eat, Lori! Almost–with my sweet tooth, I’m sure I’d find a way. Thanks for co-hosting #BloggingGrandmothersLinkParty. I’ve shared this on social media. What perfect cookies! Sugar cookies are one of my favorites and these are soooo pretty.I enjoy co-hosting with you at the #BloggingGrandmothersLinkParty. Pinned and shared! These cookies look so cute and perfect for Fall, Lori! Thanks for sharing with us at #BloggingGrandmothersLinkParty. I will be sharing on social media. Have a lovely week. Your fall leaf cookies are so pretty! What a great addition to a fall party they would be. Pinning. They’re pretty and fun to make! Thank you Dee!